On September 8th, Raymond Emile Paquette of Edmonton passed peacefully into the presence of his Lord, after a long and full life, rich in love and adventure. His family mourns his loss but celebrates the gifts of Ray’s amazing 91-year journey. He will always live in the hearts of his loving wife, Ellen; his daughters, Dianne (Ted), Carol (Isai) and Julie (Cameron); his daughter-in-law, Janet; his grandchildren, Ashley, Laura, Rosalie (Nick), Tyler (Amy), Leo and Scarlett; and his great-grandson, Ewan. He was predeceased by his dear son, Raymond, in 1993. 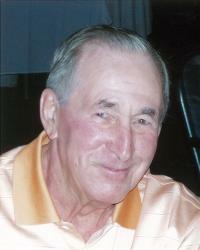 Ray was loved by the extended clan of Vlieg relations, many nieces and nephews, and friends. After a rewarding career as an electrician, he enjoyed retirement on the golf course, and pursuing other sports. A celebration of Ray’s life will take place Monday, Sept. 17, at 1 p.m. at Inglewood Christian Reformed Church, 12330 113 St., Edmonton. Burial at Westlawn Memorial Gardens. Visitation at Foster and McGarvey Funeral Home, 10011 114 St., Edmonton, on Sunday, Sept. 16, from 4 to 6 p.m.
Ray was born in Montreal on April 30, 1927, the youngest of 15 children born to Joseph Henri Paquette and Azilda Pigeau. By the time he was born, only four siblings had survived the medical mysteries of childbirth. Ray remembers hearing that the doctor had advised his mom not to have any more children. He was baptized in the Roman Catholic Church as Raymond Emile Paquette, but was known for most of his life simply as Ray. His spirit of adventure surfaced early. After he was rejected for military service during the Second World War because he was underage, he set his sights on the Merchant Marine service on the Great Lakes. Tanker ships moved materials from Canada to the United States in the late 40s and early 50s across the Great Lakes, offering many young men exciting jobs on big ships. Ray loved the adventure. He returned from his travels after several years and took on the electrical trade, a career he pursued for decades and fulfilled his desire to explore new places and test himself in large industrial settings. That took him across Canada and, as he was proud to recall, to every province in Canada except Prince Edward Island. In those early years of his cross-Canada work as an electrician, he married and started a family. Raymond was born in 1954 and Dianne in 1957. They eventually settled in Beloil, a suburb of Montreal, and Ray took on the joys of fatherhood, particularly supporting his kids in their activities and playing hockey with his son. In the late 70s, his marriage ended and he relocated to Alberta with his electrical company, where he assumed a management role. That set the stage for a new phase in his life. In the early 80s he married Ellen Vlieg, who brought into his life a large clan of relatives and an active, committed church community. It was the change Ray needed and welcomed in his life. Living with him at that time was his son Raymond, who met Ellen’s sister, Janet. When they married, the Vlieg and Paquette families overlapped in so many ways, the joy was complete. Ray and Ellen’s daughters, Carol and Julie, born in 1987 and 1990 respectively, grew up with Raymond and Janet’s four children, who were born around the same time. Raymond died tragically in 1993, a cause of deep sorrow to Ray. But he retired from his working life soon after and devoted himself to being an active father and grandfather to six children. He taught them all to skate and ski and was the team leader on annual ski trips to Jasper. He looked after school field trips, daily school pickups, parent-helper days and sick days, squeezing in his own commitments to golf, curling, bowling and any other sport that appealed to him. He helped with Inglewood Christian Reformed Church's two major renovation projects and was a driver for the single parents ministry at his church. Ray was a quiet, unassuming and faithful member of the Inglewood CRC community, whose sense of compassion found a home in the efforts of our church to help those in need. Ray had a heart for people in trouble, who struggled to survive difficult circumstances. After several years of struggle with failing health, Ray passed into the presence of his Lord on Sept. 8, 2018. Well done, thou good and faithful servant!